The back half of Unbreakable Kimmy Schmidt’s final season taps into what has always been the most surprising strength of this show: its ability to tell stories about trauma, healing, and mental health within the context of its extremely absurd, detached-from-reality world. Many doubted the show’s premise when it began, and now in its final season, Unbreakable Kimmy Schmidt has come a long way, proving time and again that it is possible to make a comedy about a woman who was kidnapped and held in a bunker by an abusive monster for a decade and also possible to do so without ignoring the genuine horrors of that backstory. The show didn’t just throw Kimmy into her new life and turn this into a simple fish-out-of-water comedy. The psychological effects of her experiences have been consistent throughlines in the series, helping ground what is otherwise a cartoonish narrative that, like Tina Fey and Robert Carlock’s previous hit 30 Rock, is never afraid to take weird and make it weirder. In “Kimmy Fights a Fire Monster!,” Kimmy comes face-to-face with the bunker in the form of Donna Maria. They haven’t seen each other since the trial, and when Kimmy learns that Donna Maria has been spending a lot of time in NYC expanding her salsa brand with a book tour and restaurant launch, she’s upset. Why wouldn’t Donna Maria want to see her? Kimmy would be upset about anyone she has ever come in contact with not letting her know they’re in town, but the fact that it’s one of her fellow mole women hurts her even more. They share a special bond, Kimmy insists. Donna Maria diagrees. In her mind, she and Kimmy are not friends. Sharing trauma, she explains, is not the foundation for friendship. Unbreakable Kimmy Schmidt makes this conflict nuanced and smart by giving equal credence and weight to both sides. “We have nothing in common,” Donna Maria says, and to an extent she’s right. But Kimmy counters: They have the bunker in common. Her point is anchored by flashbacks to the bunker, which underscore the absurd horrors they were put through and the weird lengths the reverend went to in order to confused, frighten, and manipulate the women. Kimmy has a point. There are only three other people on the planet who understand what she went through, and Donna Maria is one of them. But Donna Maria has a point, too. “Relationships based on intense experiences never work,” she says, quoting Speed. Because the only thing Donna Maria and Kimmy have in common is the bunker, it means the bunker becomes a focus of their conversations and of their relationship. Donna Maria doesn’t want that. Kimmy has often had to grapple with the fact that different people process in different ways. Her own processing method recently shifted from trying to suppress thoughts and talk about the bunker to being more open about it. But Donna Maria doesn’t take that approach for herself; she wants to focus on her business, not relive the bunker. Both approaches to coping are presented as valid. But Unbreakable Kimmy Schmidt also poignantly points out that even if Donna Maria doesn’t want to relive the bunker, sometimes they have no choice. When a guy in a costume at a children’s birthday party triggers memories of “the fire monster”—another one of the reverend’s elaborate machinations—they almost unthinkingly snap into action, working together to take out the man. As often is the case, Kimmy’s storyline ends up being the strongest of the season’s return. Titus and Jacqueline’s respective subplots aren’t without their gems. Titus becomes convinced he’s being followed by a fan of his breakout performance...as Daredevil’s doorman, only to learn that the guy who has been following him around is actually doing oppo research on him because of the sexual harassment he experienced at the hands of abusive puppet Mr. Frumpus. The puppet’s #MeToo reckoning is coming, and this storyline is a stark example of the show’s balancing act when it comes to the absurd and the real. Unbreakable Kimmy Schmidt, it turns out, isn’t so detached from reality. It’s taking on #MeToo and Times Up storylines more directly than any show on television right now, making it a core part of this final season. And it might be easy to say that its attitude toward these issues is flippant, given that I literally just wrote the words “abusive puppet,” but that isn’t what this feels like — for now, at least. The show has, in the past, taken some of these setups too far or in a confusing direction. The jarring tone of Unbreakable Kimmy Schmidt’s sense of humor, rather, makes the disturbing point that sexual abuse and abuse of power are so deeply embedded in society that you never feel totally safe. As Kimmy has learned many times, the bunker takes many forms, and life on the outside isn’t free of the same power structures that kept her down there. Jacqueline’s escapades with younger men at Home Basics, while providing some of the funniest parts of the episode, is less effective. Jacqueline, Lillian, and Mimi Kanasis (a fun return for Amy Sedaris, who is maybe the only person on the planet who can pull off that laugh-to-cry transition she does in this episode so perfectly) develop a false sense of empowerment in thinking that they’re free to hook with guys half their age. But their fantasy comes crashing down when they realize that all of the boys they’re hitting on are somebody’s son (one, in fact, is actually Mimi’s son). That conclusion doesn’t end up feeling all that meaningful, and Lillian’s worldview that the #MeToo movement has hindered guys’ abilities to pick up women is literally textbook incel rhetoric and never really goes challenged by the episode, perpetuating a dangerous idea. 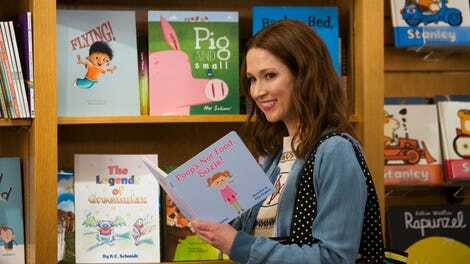 Unbreakable Kimmy Schmidt takes big swings with its storytelling that leans into current events, but this particular subplot feels underdeveloped and clumsy. I didn’t catch at first that Titus was using a mnemonic to spell his own last name, and once I did I almost fell out my chair. Kimmy dancing while angry is such a perfect example of Ellie Kemper’s superb physical comedy abilities.